Cavolo nero is my favorite type of cabbage. 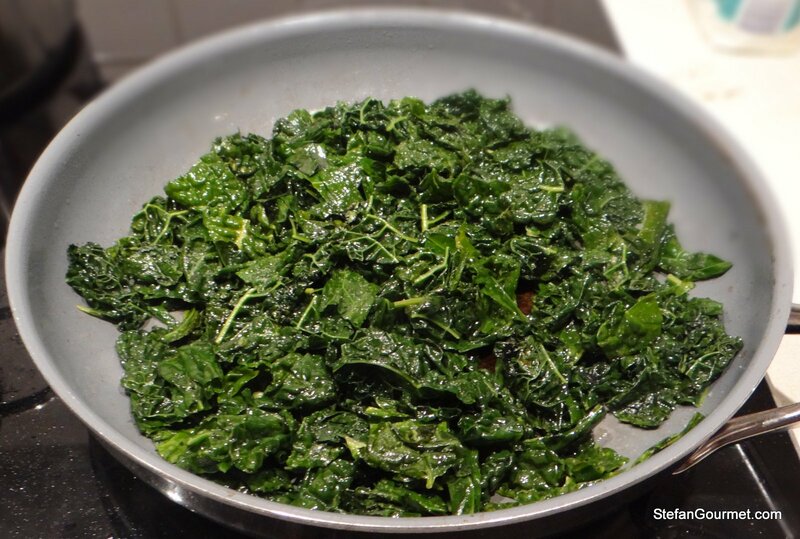 You could substitute with kale if you can’t find cavolo nero, but cavolo nero has a sweeter taste. You can think of it as the elegant Italian cousin of kale. This pasta dish is quick, easy, and delicious. 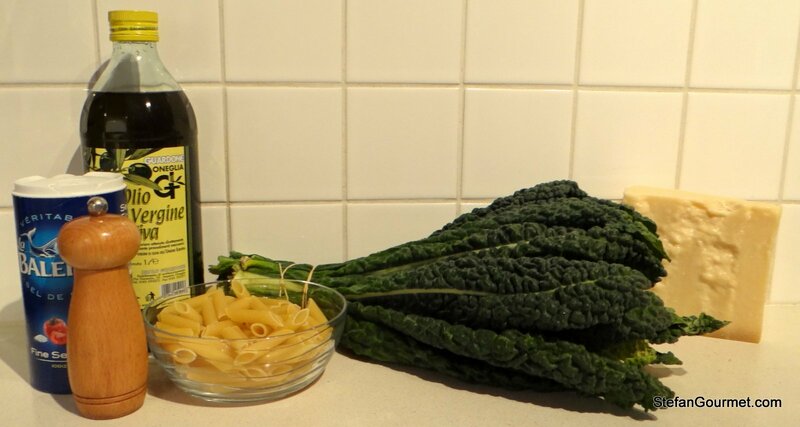 The cavolo nero is parboiled and then stir fried while the pasta is cooking. To complete the dish, the cavolo and pasta are tossed with parmigiano and a bit of the pasta cooking water. 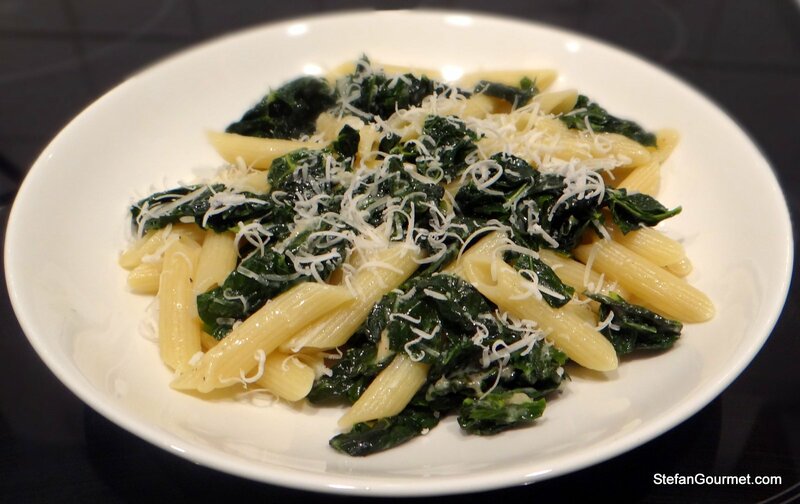 The ‘sauce’ that is thus created of the cooking water and parmigiano is very creamy and works very well with the flavor and crunchiness of the cavolo nero. This is not a classic Italian dish, but something I’ve created myself in the spirit of Italian cooking: a limited number of ingredients, a simple preparation, and a very tasty dish. The great blog of Conor is a good reminder for me that you don’t need a lot of ingredients or fancy techniques to make something delicious. 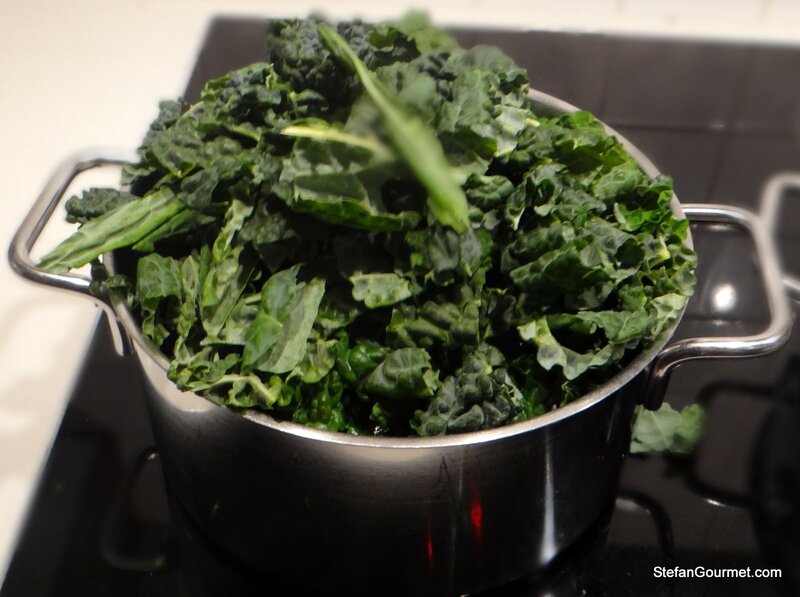 Fill a pot with water and add a pinch of baking powder to make the water alkaline (rather than acid) to keep the green color of the cavolo nero. 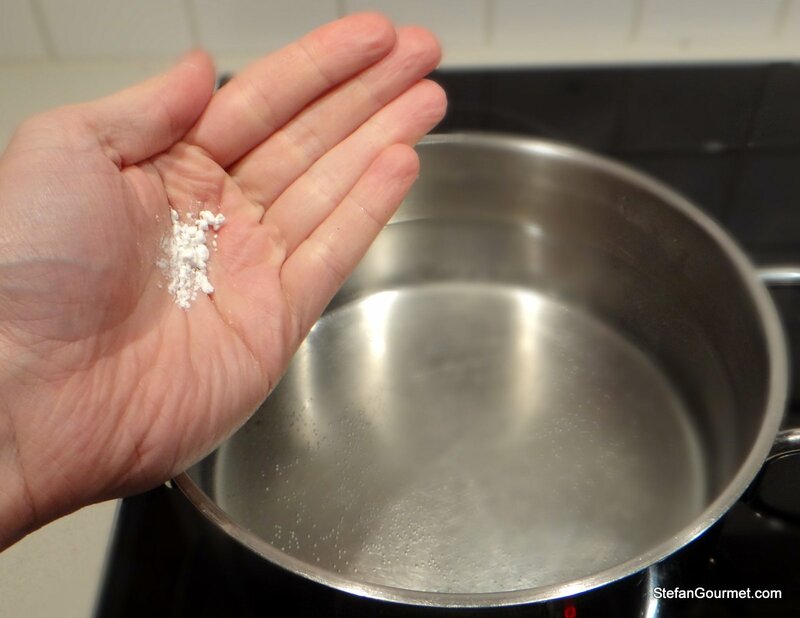 Bring the water to a boil while you clean the cavolo. 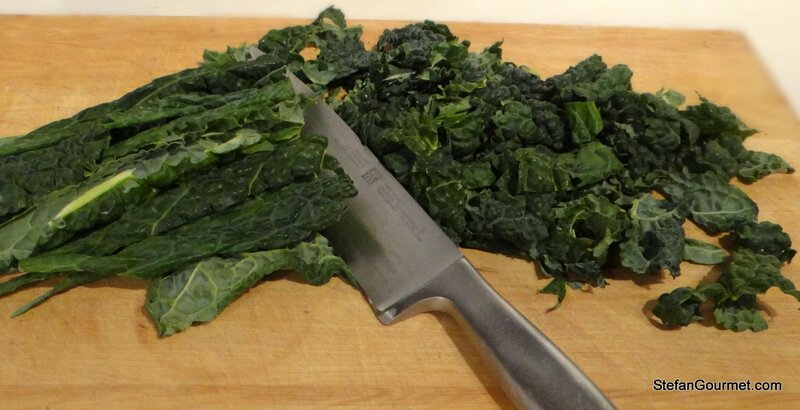 Cut the tough rib out of the cavolo nero. 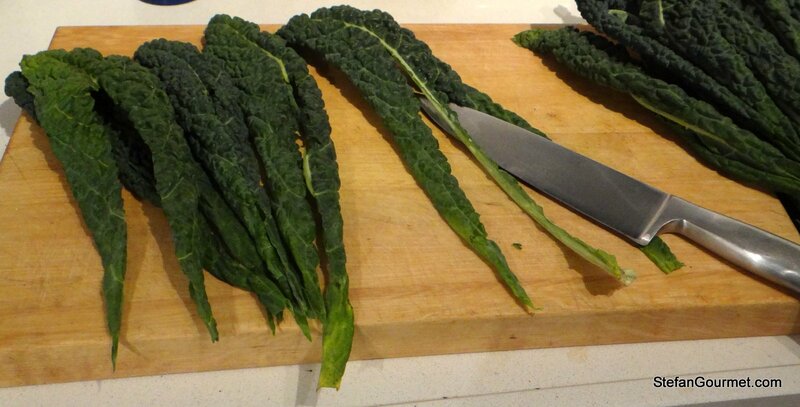 Then cut the cavolo nero into ribbons. 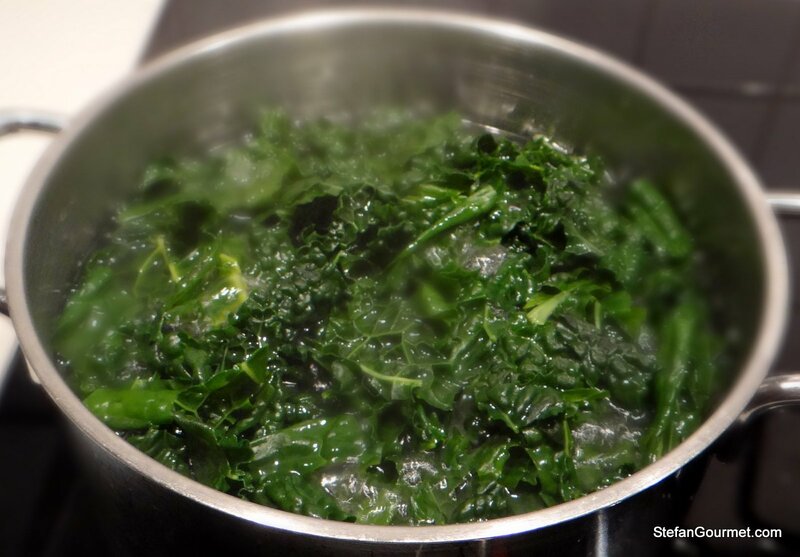 Add the cavolo nero to the boiling water with baking powder. Meanwhile, cook the penne pasta al dente according to package instructions in boiling salted water. 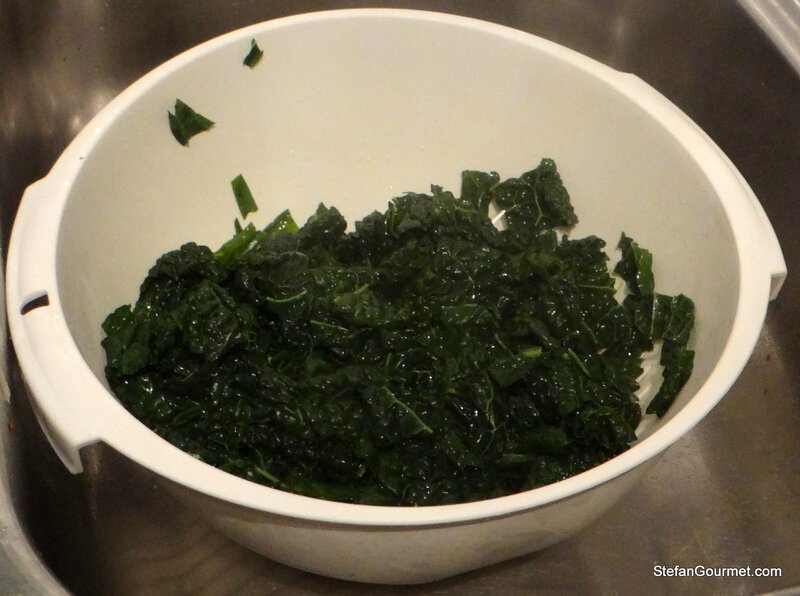 Drain the cavolo nero when it’s finished parboiling. Heat the oil in a frying pan. Sauté the clove of garlic on all sides until it’s nicely browned to flavor the oil. Discard the garlic and add the cavolo nero. Stir fry the cavolo nero for about 3 minutes over high heat. Season with a bit of salt and freshly ground black pepper. 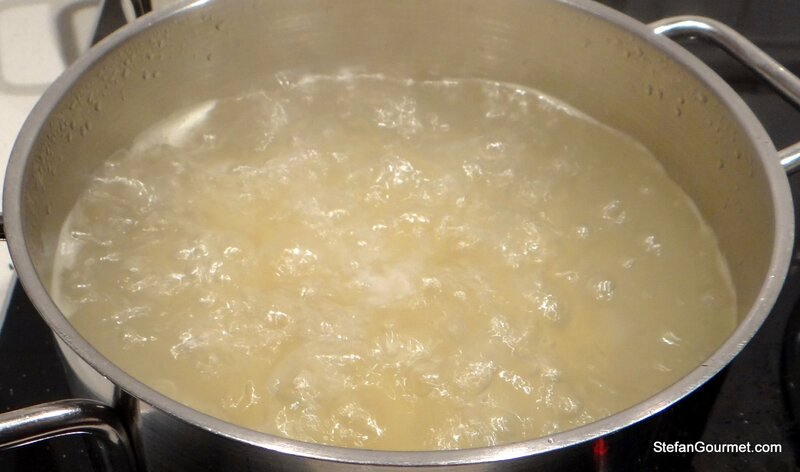 When the pasta is cooked, drain it but reserve some of the cooking water. 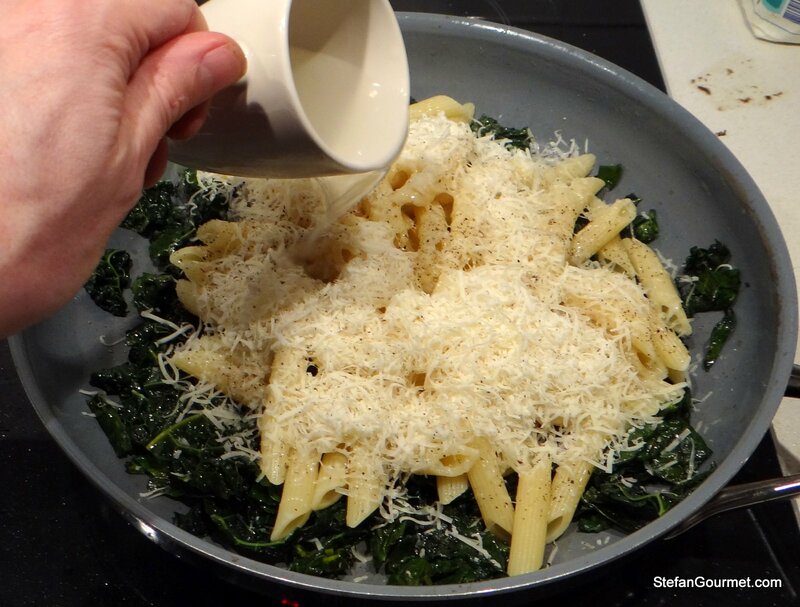 Add the penne, the parmigiano and a few tablespoons of the cooking water to the cavolo nero. Serve on warm plates, sprinkled with some more parmigiano. I’ve never heard of this cabbage, but it looks lovely! It’d work with kale as well. Especially since the kale in the US is nicer than ours. 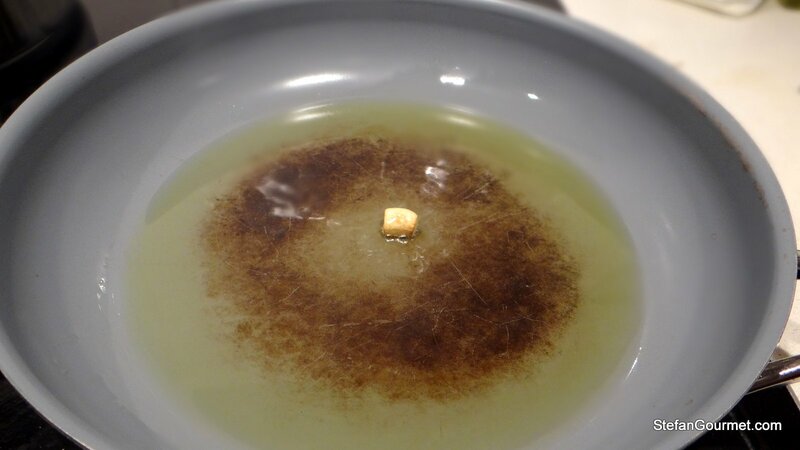 This is a lovely looking, simple dish Stefan. My kind of food. How did I miss that? Time for sleep, methinks. Love the step by step photography you have there! Very nice looking pasta dish too. Thanks, Evan, for visiting and taking the time to leave such a nice comment. Excellent concept for a recipe! I’m going to try it with fresh spinach ’cause I’m a big fan of fresh spinach. And I’m a big fan of this recipe ’cause it’s something I can cook up quickly – and yet it’ll be delish. I think I’m going to add pine nuts simply because I adore pine nuts. 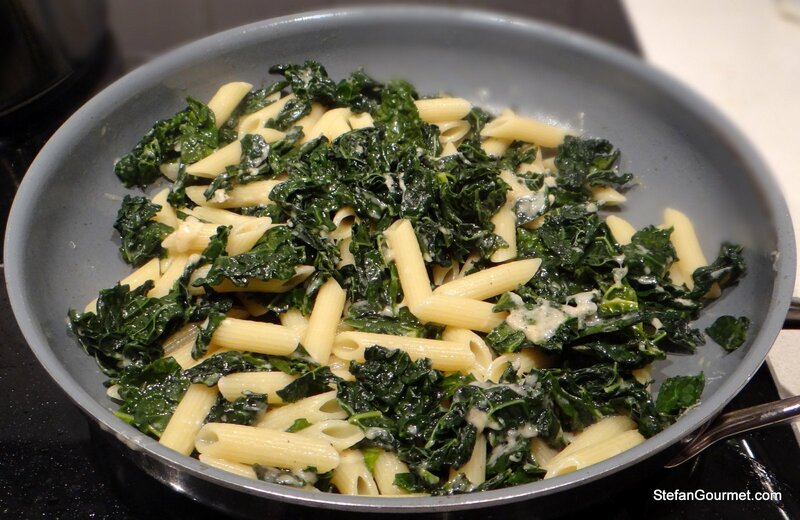 It sounds like you already make something close to the recipe I proposed (with spinach in lieu of the cavolo). The main difference is that I also make a creamy ‘sauce’ by mixing the parmigiano with some cooking water. I’ve got to remember your ‘trick’ of mixing the Paremesan with some of the cooking water!! Now kale is for some reason not something we oft see in the supermarket vegetable section [never mind about cavolo nero; that you grow yourself or go without!!] ~ got a beautiful bunch yesterday: guess where that is heading? Yum recipe AND simple 🙂 ! I actually saw kale at every Woolies we visited in NT and my friends from Adelaide got cavolo nero from the market there. That sounds like a great recipe to try out with some daikon greens I have already blanched and sitting in my freezer waiting for inspiration! 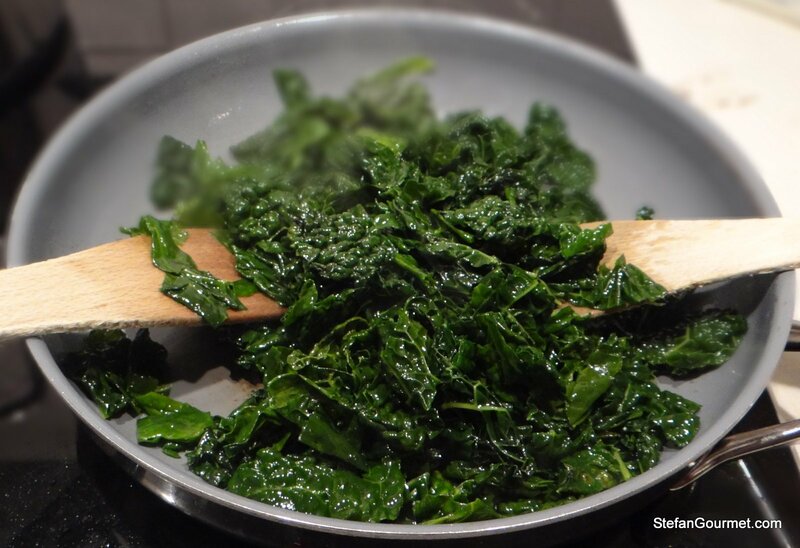 Your preparation of the cavolo nero with blanching and sautéing in the garlic-infused oil looks so toothsome! With al dente pasta and parmigiano reggiano, It is a comforting yet elegant dish. I would eat this any night quite happily – succulent recipe! You definitely could do that, or even use only butter. It would work better with clarified butter (as that won’t burn). On Martha’s Vineyard the supermarket sells locally grown “Latinate kale” which is identical to cavolo nero. There are a lot of people here of Portuguese culture going back to the whaling days so maybe that is the source. Hi, I am from Italy and been leaving In the US for more than 16 years. Here in NC we can find cavolo nero at our local supermarket and also at Earthfare and Wholefoods; they call it “lacinato kale”. I love ribollita and when I finally found cavolo nero I was so excited! You have a great blog by the way. Thanks, Monica. Ribollita is on my (long) list of recipes I’d like to make. I guess I’ll wait until summer is over for that one though.